Now, you have two great choices for framing your ketubah. Those couples wanting a complete solution will be thrilled with our patented Premium “Hinged” Frame. 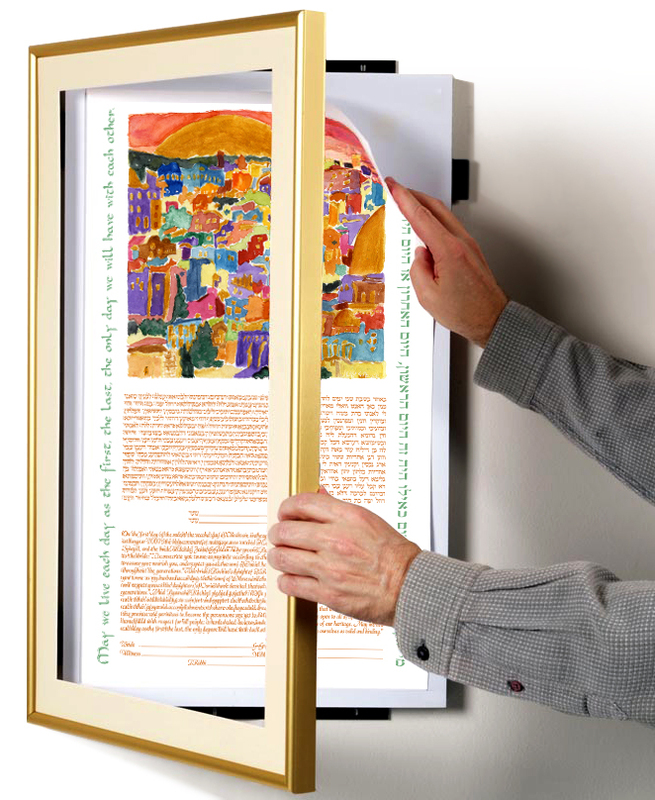 Your ketubah will come mounted inside a patented “hinged” frame that opens like a medicine cabinet to give you easy access for signing your ketubah. Afterward, simply close and lock the frame to display your ketubah at the wedding or reception, then mount it on your wall at home to enjoy for years. Each frame includes a single matte. Seeking a more budget-conscious option? Now you can opt for our Standard “DIY” Frame. Your ketubah will come to you professionally mounted in a beautiful, archival frame but without the acrylic front inserted. This gives you easy access for signing the ketubah. Then before you display the ketubah, you’ll want to take the frame apart and insert the acrylic in a simple process that takes just minutes. It’s then ready to show at your wedding or reception or to be hung on your wall at home. Each frame includes a single matte. We offer five different wooden frames -- Walnut, Cherry, Pecan, Natural, and Black -- and three satin aluminum frames -- Black, Gold, and Silver. You can combine those with ten different matte colors -- Black, White, Tan, Light Brown, Dark Yellow, Dark Green, Light Green, Dark Blue, Orange, and Maroon. As you are shopping for your ketubah, click the link on any ketubah detail page that says "View Framing Options" to see your favorite ketubah with all of our available frame and matte options. Click on each frame/matte color combination icon to see which frame and matte best suites your taste. 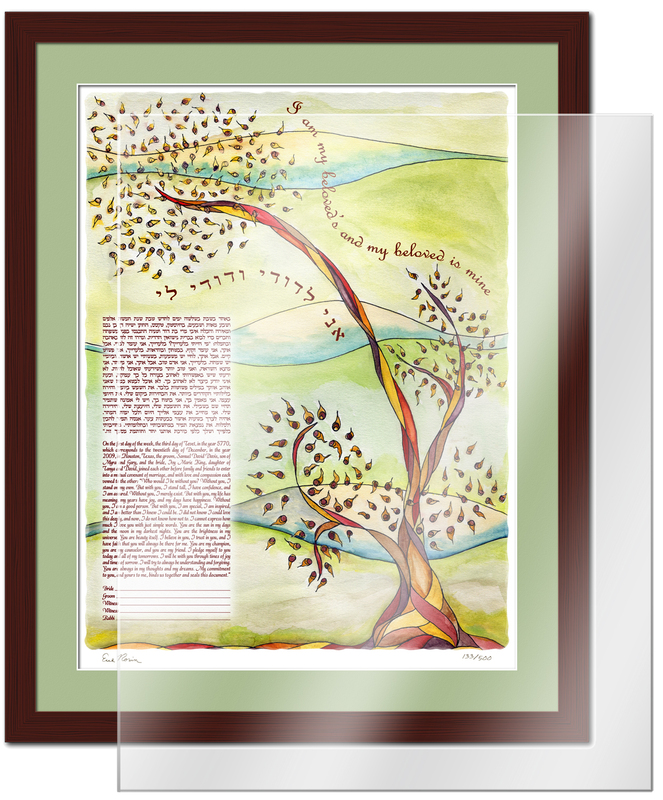 It is a good idea to purchase the frame of your choice at the time you purchase your ketubah. We need to have both the ketubah and frame at the same time to ensure proper fit and installation, so ordering them at the same time will eliminate the need and cost for you to ship your ketubah back to us or have us reprint your ketubah for you ($75). Also, we do not recommend purchasing one of our special hinged frames after your ceremony (or to arrive after your ceremony). In those instances, you will be paying a premium for the patented hinged mechanism, which is something you no longer need. It would be best for you to simply take your ketubah to a local framer to have it framed professionally. One of the beautiful aspects of canvas is it does not need to be framed behind glass. With that in mind, you can have your Canvas Edition ketubah with a contemporary Museum Wrap (white edges) or Gallery Wrap (artwork on edges) or our Canvas Frame (no matte or glass), so you won't lose the beauty of the texture of the canvas for which you paid extra.